TCA is a powerful exfoliator used to remove dead skin cells on the surface of the skin and decrease the appearance of Scars, Wrinkles, and Fine Lines associated with premature aging. Salicylic Acid, a beta hydroxy acid and deep cleanser used to minimize acne breakouts by working deep into the pores where oil, dirt, and other impurities build up and block the follicle of the hair. Salicylic works to unclog the pores by increasing the cell turnover rate. Infused with a unique combination of botanical extracts which work synergistically to provide natural anti-bacterial, anti-inflammatory, and anti-oxidant properties. Salicylic Acid: a beta-hydroxy acid and outstanding deep cleanser most commonly used to treat comedonal or non-inflamed acne. Acne originates by an excess secretion of oils from the sebaceous glands in conjunction with dead skin cells (corneocytes) which block the follicle of the hair. These oil secretions build up underneath the blocked pore, creating a perfect environment for bacteria. Salicylic’s larger molecular size, allows it to generate less irritation than the alpha hydroxy acids (glycolic acid, lactic acid etc. ), permitting the structure to cling to the surface for longer periods of time, resulting in a more efficient cleansing of the pores. Salicylic also destroys the bacteria below the surface, helping to unclog the pores through exfoliation, creating better breathing passages for the skin. Green Tea Extract (Camellia Sinensis Leaf Extract): a natural extract, containing a catechin (antioxidant), known as epigallocatechin (EGCG) which exhibits antibacterial and anti-inflammatory properties. Green tea will help reduce inflammation in the skin and fight off free radicals that cause damage to the cells and tissues in the body. Green tea’s antibacterial properties are capable of also killing the propionibacterium acnes responsible for acne. An independent study by Dr. Gan-Wong reported that the results in treating acne with a 3% green tea cream, to a 4% benzoyl peroxide solution were nearly the same. Green tea extract has few to no side effects compared to drug based products. According to another study in the “journal of drugs in Dermatology”, green tea is more effective when applied topically, and can also be used as a mild cleanser and exfoliant of the skin. Cucumber(Cucumis Sativus): an excellent source of silica, a mineral which strengthens our connective tissues. Cucumbers also contain ascorbic and caffeic acids which help treat swollen or puffy eyes, dark circles, freckles, sun-burns, pores, and dermatitis. A study performed by Edith M. Carlisle, Ph.D, showed that cucumber produced 100 times more bone collagen compared to those who did not receive a dietary silica. Silica’s enhancement of connective tissue repair is key to a more youthful appearance of the skin. A deficiency of silica accelerates the skin aging process, as tissues cannot hold water efficiently. Cucumber also works well to treat sun-damaged or burned skin, acne skin, and dehydrated skin. Really effective, deep peel without the down time (your face won't look burnt or crazy if you follow the directions). Perfect for beginners (like me). Great for age spots, redness, and scars. This product is incredible. I used it the first night it came in the mail. I followed the instructions and left the product on for about 2 minutes then washed it off. At first my face was red but it went back to normal after 30 minutes. The next morning, I couldn't believe my eyes. My hyperpigmented scars have diminished noticeably then they ever have with any treatment I have used, and this was only OVERNIGHT. I was looking in the mirror and emotionally, I was very moved. After I had given up hope, this product has helped me realize that I shouldn't give up on my goal of having clear skin. As of right now it has only been 3 days since my first use of the product, but I cannot wait to see my next results in weeks to come. It does exactly as promised, with a gentle formula, a great smell and a low price. Depending on how long I leave the product on(about 5 mins in face and 10 on my back and the backs of my hands) my peeling is very minimal. But my age spots, acne scars, and wrinkles are much reduced. I have fewer breakouts and my pores look smaller and 'cleaner.'. Overall, my skin is fresher and clearer and the tone is much improved. I use the peel one time a week for 6 weeks and then wait 2-3 months and repeat the process. Just follow the very complete directions included and you'll be fine. 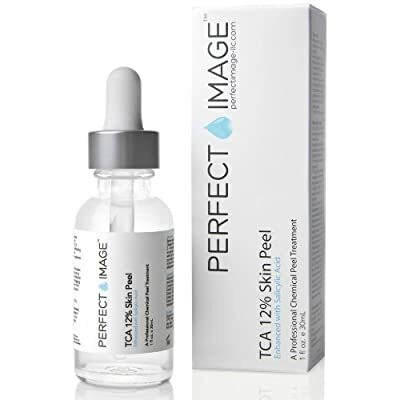 I've been using the TCA peel from Perfect Image for a few months now and I can truly say that it has worked wonders for my face. 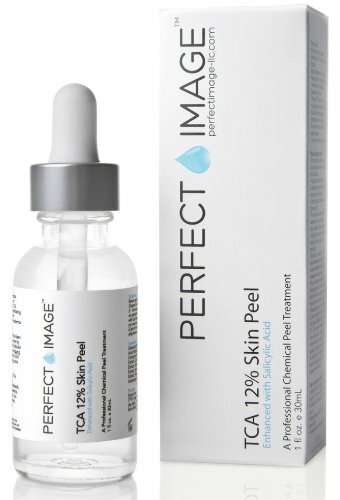 To someone with problematic acne, acne scars, and hyper-pigmentation, this peel is truly a godsend. I've tried other peels before and none of them gave me a peeling effect like the TCA. Unlike my glycolic and salicylic peels which only caused light shedding, the TCA peel caused my whole face to peel within days and was more affective towards removing scars and hyper-pigmentation.